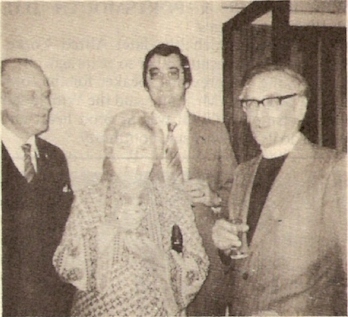 After all the hard work, the planning and the excitement of the past two years when the Guild celebrated its centenary (1979) and then was host to the Central Council for its annual meeting (1980) and later the Ringing School at Winchester, the Annual Dinner was a somewhat smaller and quieter function, but nonetheless a most enjoyable affair. This year it was held at The Royal Beach Hotel on the sea front at Southsea and was attended by about 80 members, guests and visitors. The Master (Mrs Gilian Davis) presided. After a most excellent and well-served dinner, and the toast to HM The Queen, proposed by the Master, there was a brief interlude, following which Canon Ronald Milner of the City Centre Parish of Southampton (where the Guild will this year hold its agm in July) was introduced by the Master and invited to propose "The Guild". "Hark! do you hear - Our clappers want beer". 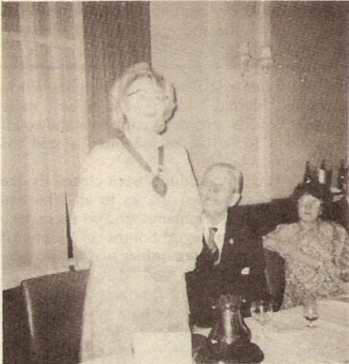 The Master (Mrs. Gilian Davis) thanking the Dinner and Social Committee members, watched by her husband (Arthur V) and Mrs. Gail Cater. A jugg of beer must pay for that! Canon Ronald Milner (Team Rector, Southampton Team Ministry) Mrs. Milner and Mr. Michael Bubb (Guernsey, Chairman, Channel Islands District) who proposed the guests and visitors. There was today, continued the speaker, a greater co-operation between belfry and sanctuary. During the last 100 years there was determination to replace poor tower discipline by a new perfection in ringing - a new pride in performance and a desire to establish ringers as an integral part of the work of the Church. To Guilds, such as our own and to the Central Council and its work we owe a debt of gratitude. The outlook is good with so many young people coming forward to ring today, concluded Canon Milner, who asked the company to drink a toast to the Winchester and Portsmouth Guild, remembering especially the new District formed in the Channel Islands. Replying on behalf of the W & P, Mr. Robert Cater (Winchester) said "Continuity" was the keyword for the success of the Exercise and the Guild. He referred to his own tower - Winchester Cathedral - and of the continuity there, for records existed for over 200 years. The ringers there today were the latest of the line. They would ensure that ringers were taught - not by the old method of "sitting beside Auntie" to see what she did but in the up-to-date ways of the Education Committee of the Central Council and their own Guild Education Committee. Mr. Cater produced three books dating from 1911-1960 in which a sort of diary had been kept telling of the attendances at ringing with often a full complement present at 5.30 a.m. - and of touches rung for services. He quoted from these books and said they made very interesting reading. Referring to funds raised in the Winchester District for restoration work, Mr. Cater said that small amounts were used for preventative maintenance - to keep existing rings in good going order, rather than spending it all on one or two complete restorations where bells were out of use. It was also essential, he continued, to ensure that young ringers were encouraged and their interest maintained and with so many other distractions this was not easy. He referred in detail to the five various courses arranged by the Guild. He also spoke of the Central Council's course in Winchester in July/August and the C.C. Education Committee's standards of ringing which were similar to those of the College of Campanology which (the late) Alfred Yorke-Bramble had advocated 30 or so years ago. Thanking the previous speaker for the toast he had proposed, Mr. Cater said the Winchester and Portsmouth Guild was in good heart and would do its best to ensure continuity. Mr. Robert Cater (Winchester Cathedral) who replied to the toast of the Guild. Enjoying a pint is Mark Temple. The Chairman then introduced four members of the Winchester District who entertained the company with paraphrases of a "psalm-like" carolling - the words referring to bells, bell-ringing and all that goes on in the towers. Put together by Graham Grant, the other three who harmonised with him in the chants were: Philip and Eileen Gorrod and Alison Surry. They received a great ovation at the conclusion. Chairman of the "soon to be ratified" new Channel Islands District of the Guild, Mr. Michael Bubb (Guernsey) proposed "The Guests and Visitors". For those who did not know of the new Channel Islands District, he gave full details of the towers and the three Islands, their history, the progress made over the years and of their hopes for the future. 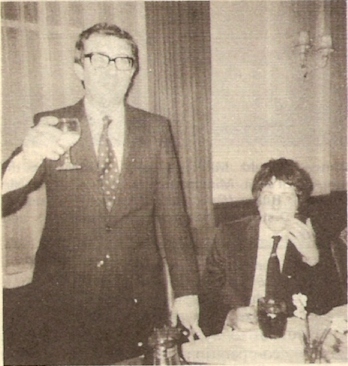 Visitors, said Mr. Bubb, were always welcomed in the Channel Islands, and it was by their help and encouragement that progress towards the new District was made. Visiting among ringers was part of the heritage which was so enjoyed by us all and those visitors present that evening were very welcome. The Ringing World Editor (Charles Denyer) acknowledging the toast on behalf of the guests and visitors, thanked the officers and members for their welcome and hospitality, congratulated the organisers of the evening and wished the Guild well. He then told of the appointment of a new editor, details of which would, he said, appear in the next issue of the Ringing World [cries of "Shame"]. "We want to sell more Ringing Worlds, so order a copy now and you'll see who is to be the next Editor" - said the Editor amidst laughter. The formal proceedings were closed by the Master who expressed thanks to all who had helped in the arrangements and to those who had made the journey to Southsea. "We felt it was high time that the dinner was held in the Portsmouth Diocese", said Mrs. Davis, "and your support here is much appreciated". The remainder of the evening was spent in the bar; admiring the various photographs and details of past events in the books on display; ringing handbells; or just discussing past and future events. The news that snow was falling caused several who had distances to travel to depart earlier than planned, discretion being the better part of valour.